The Fangirl’s Guide to the Galaxy has just about all the answers to any question you could possibly have about being a fangirl. Where do you begin? Where do you connect with other fans? How do you prepare for a fan convention? You can find all that and more in this book. Author Sam Maggs describes many of the various fandoms fangirls participate in, including dress, accessories and even where to start if you want to join this fandom. She describes the slang used by these fandoms, and where you can go to meet others who share your interests. 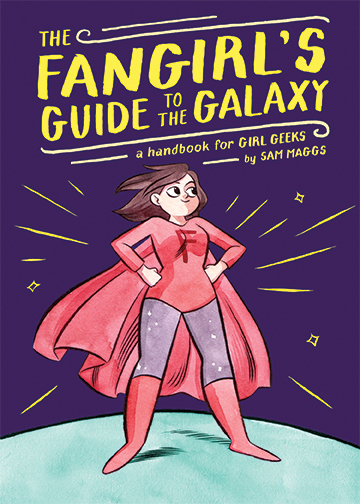 Throughout the book she also features short interviews with TV writers, authors, journalists, and various other “celebrity” geek girls about how being a fangirl has positively influenced their lives and what advice they have for fellow geek girls. I absolutely loved reading this book. I wish there had been something like this to read when I was just starting to accept my inner fangirl! There’s so many things that are helpful to know and understand – even at this stage in my life! I wish I had read it before I made an accidental Tumblr hashtag faux pas last month. (I’ve been on Tumblr for years and still haven’t learned all the ins and outs!). I also loved the chapter on fangirls and feminism. There’s so much negativity in the media towards fangirls these days, and so many issues going on that it’s important to remind girls that their passion for fandoms – whether it’s TV, movies, comics, games, etc- is just as legitimate as a guy’s. I feel this may be the most important chapter in the book, and Maggs does a good job of laying it out clearly. Maggs’ style is simple and fun to read, plus it’s evident that she is a fangirl herself. For some older readers, the writing style may seem a little too simple, but it’s still a fun read. If your new to accepting your geeky side, book will help you realize you’re not strange if you want to dress as your favorite comic book character and go out to meet other fans. I wish I had a book like this to read when I was just discovering my inner fangirl, it would have helped me realize a lot sooner that I’m not weird and I am definitely not alone. Fangirls of all ages will enjoy this book!